Purple lilikoi (passionfruit) in season. There are also gluten free items, although people with Celiac disease will still have to be very careful. This is also a more upscale farmers market compared to some others on the island. The goods here are high quality and frequently are organic or unsprayed. Bring plenty of cash. If you’re looking for super duper “good deals” and perhaps more conventional produce then I recommend going to Kahului to the Farmers Market at TJ’s store or Queen Ka’ahumanu Farmers Market. From Haleakala Highway coming from Kahului, get on Kula Highway, and look for the first major intersection with a real traffic light, maybe a quarter mile. It’s Aapueo Parkway, turn left down that road and follow the signs, or the cars. From 7 to 10 am, there will be a lot of traffic turning down that road. Allow plenty of time to look for parking because it’s a bustling market and everyone is trying to get there. This is the first major intersection driving up Kula Highway, A'apueo Parkway. There's a Longs drug store in the parking lot nearby. The subdivision is Kulamalu and there's usually a big Farmers Market sign. One of the strange things with grammar is that it could be "Farmer's Market" but is frequently "Farmers Market." Tip: Make sure to bring your own bag! Maui has a ban on plastic bags and some farmers might provide paper bags or boxes but it’s expected that if you’re going to the market, you are environmentally aware enough to bring your own bag or basket. Baskets are even better than bags because greens won’t get crushed. 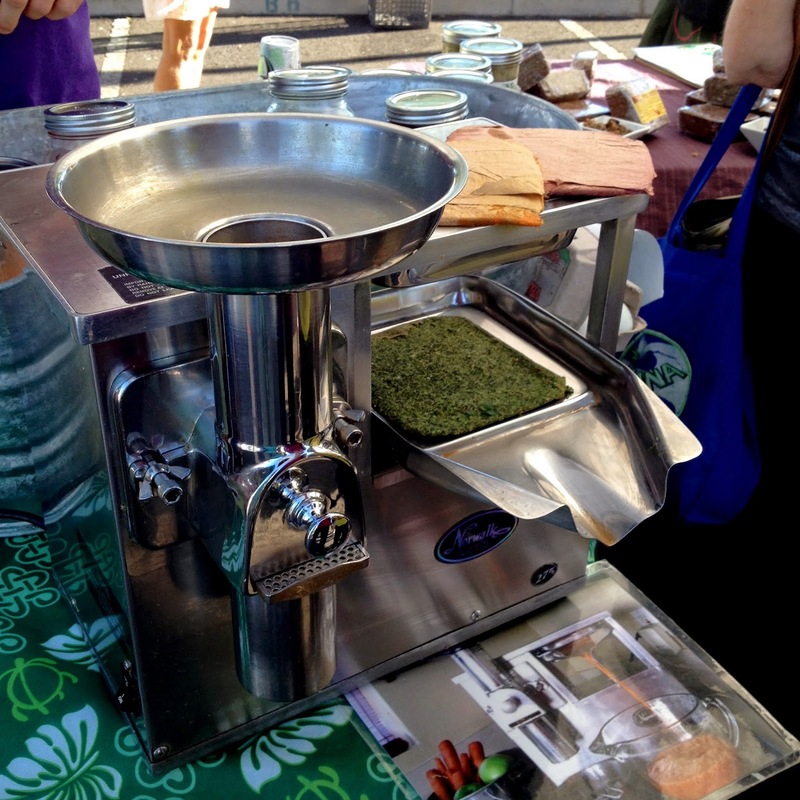 which has opened up a raw food cafe in Kahului. Tip 2: The variety changes from week to week. Most booths are regulars, but since the offerings are usually what’s in season, you may not find what you’re looking for if it’s out of season or the farmer isn’t there that day. For example, I was there on August 2nd, and found the limes and lemons I was looking for. A few weeks later, I couldn’t find any limes or lemons. 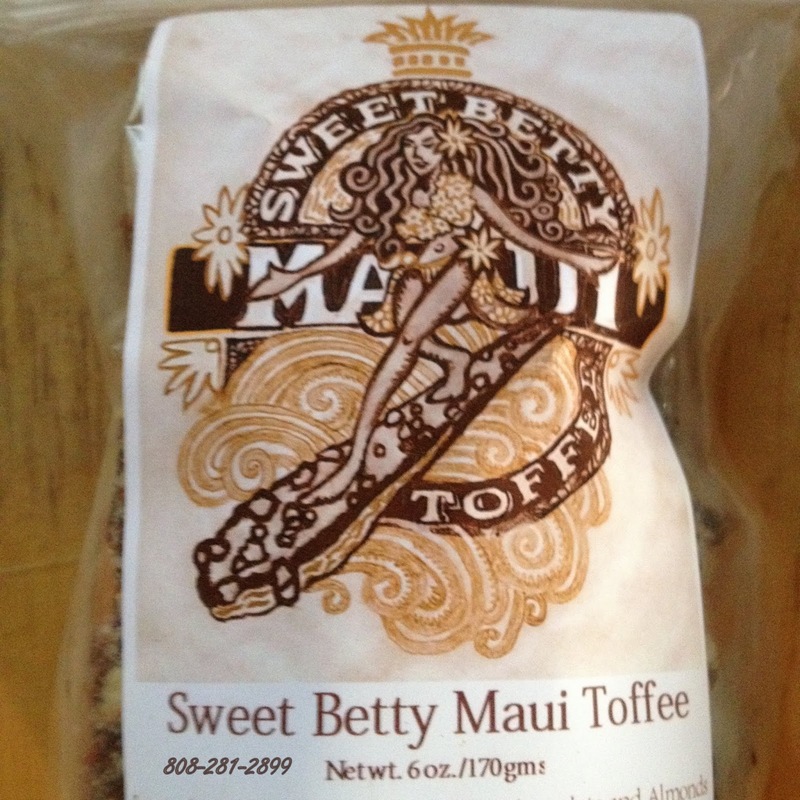 I also didn’t find the Toffee Lady – Sweet Betty’s Maui Toffee. Get the business cards or contact info for products that you care about. Toffee and other candies are hard to make on Maui because of the high humidity here. Website is www.sweetbettyconfections.com but it's down today. 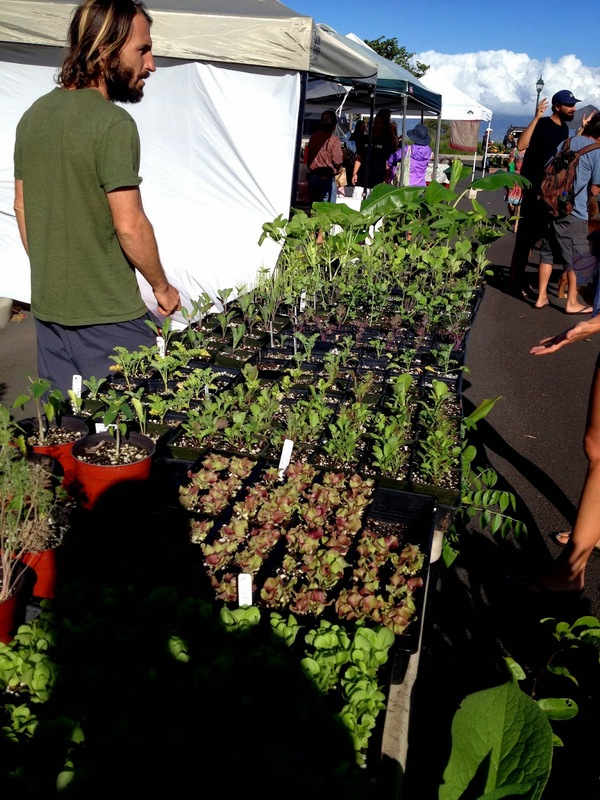 The Upcountry Farmers Market is considered the best farmers market on Maui, with the freshest produce. 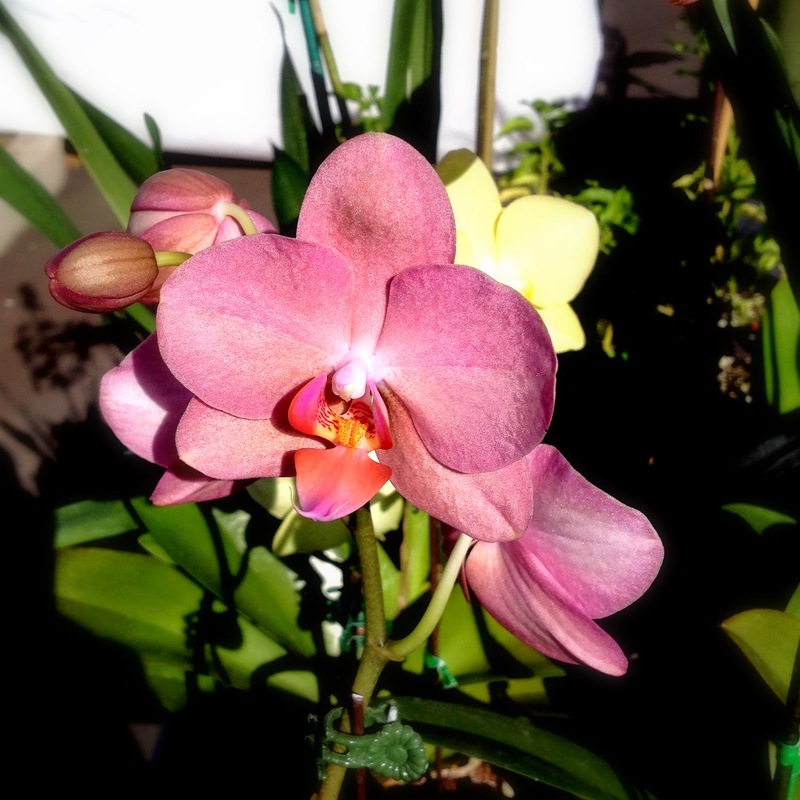 It’s the one market that I consistently recommend to visitors and it’s the most beautiful under the blue Maui skies, with sunlight falling on fresh flowers and vegetables. 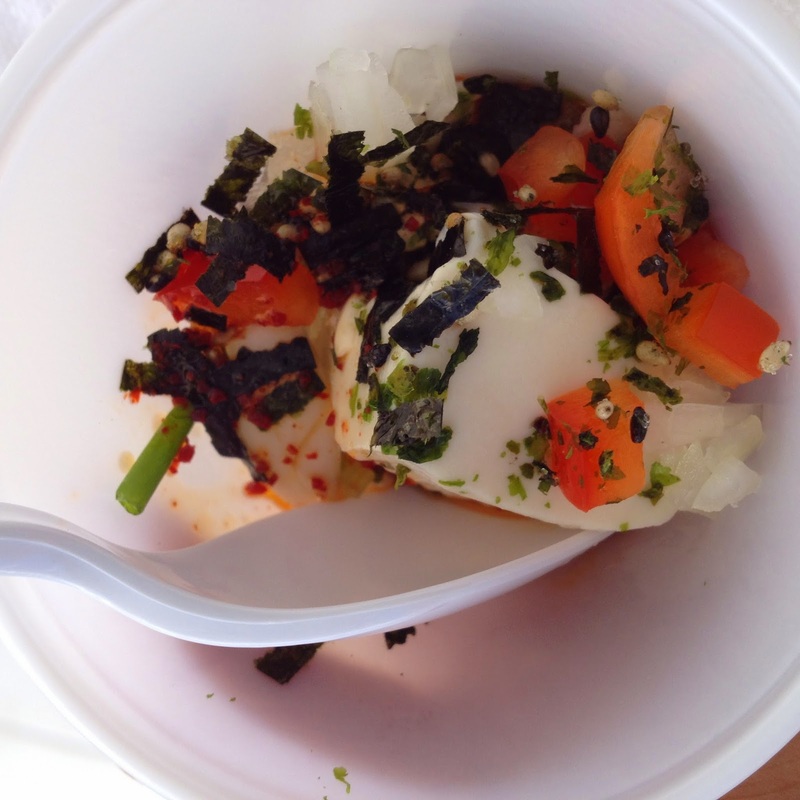 A free sample of silken tofu with seaweed sprinkles, sesame, chopped vegetables from the Korean Food booth. Yummy. Warning: if you stop by the Korean booth, they will keep piling you with free samples. 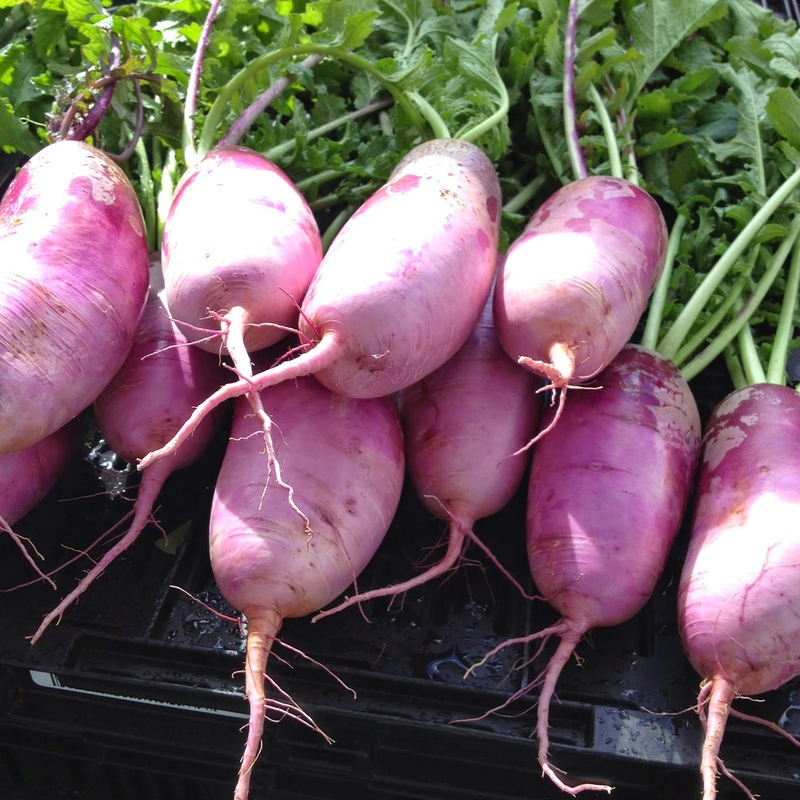 Purple daikon (Japanese radish) - they are amazingly purple inside too. Soursop tea leaves. Some people drink the tea as a cancer treatment. Ginger and lime juice. 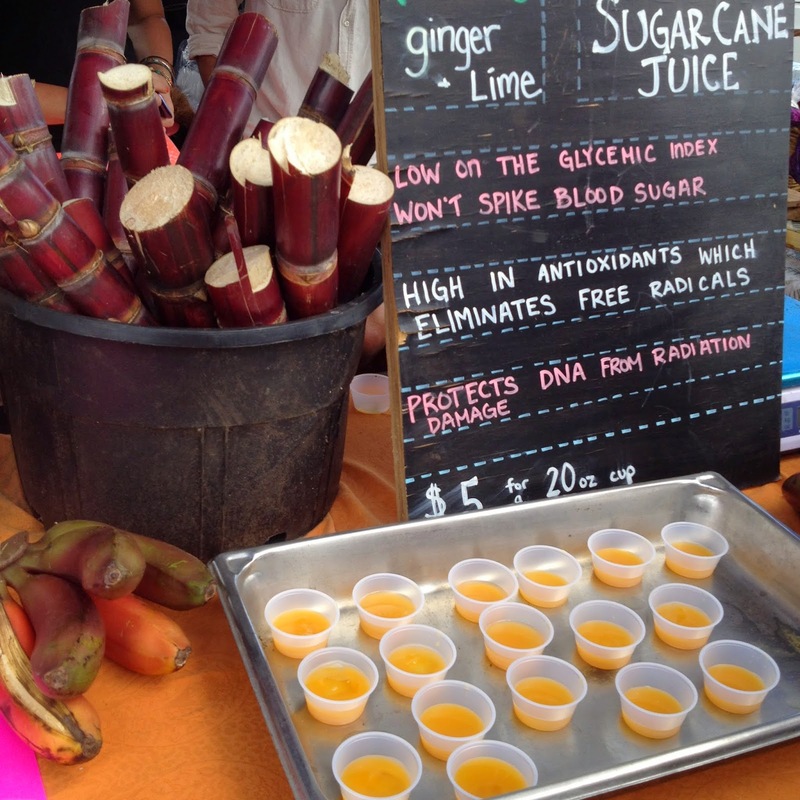 Sugar cane juice. Free samples. 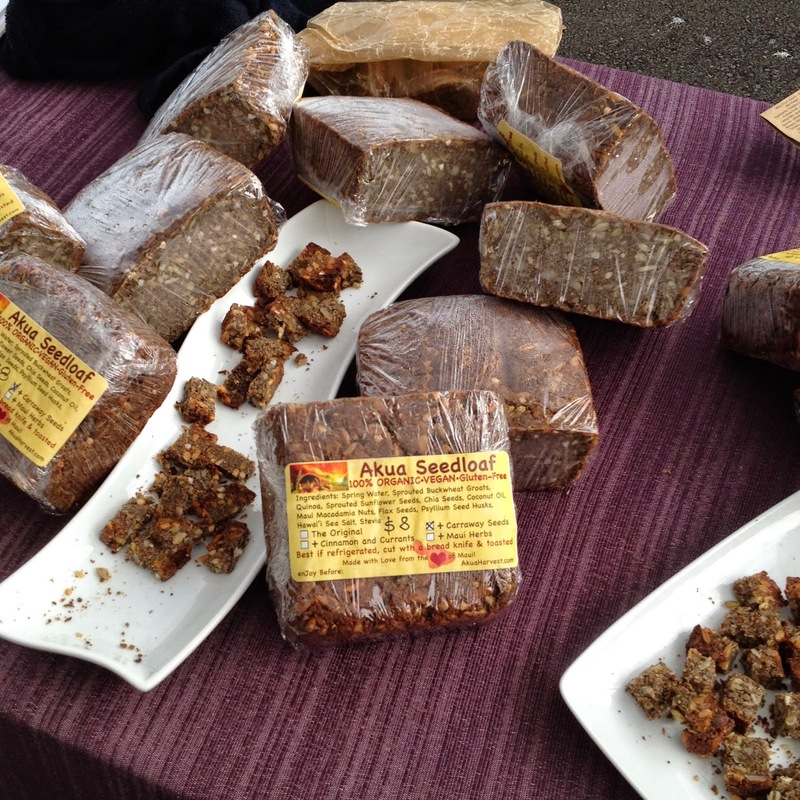 Healthy buckwheat and seed bread by Akua Harvest. Protea flowers and aloe vera. There are even fresh cut roses at this market. so it's beautiful in your garden, but watch out, it can take over. Speckled lima beans from Kupa'a Farms. Sweet ice cream beans from a big leafy ice cream bean tree. They are not frozen, but have sweet and creamy pulp around the seeds. Also, I believe the trees are nitrogen-fixers, which means they add nitrogen to the soil. My friend Perlita who is selling moringa seed pods. Moringa is a super nutritious tree. All parts of the tree are edible. Vegetable starts and seedlings to get your garden rocking. 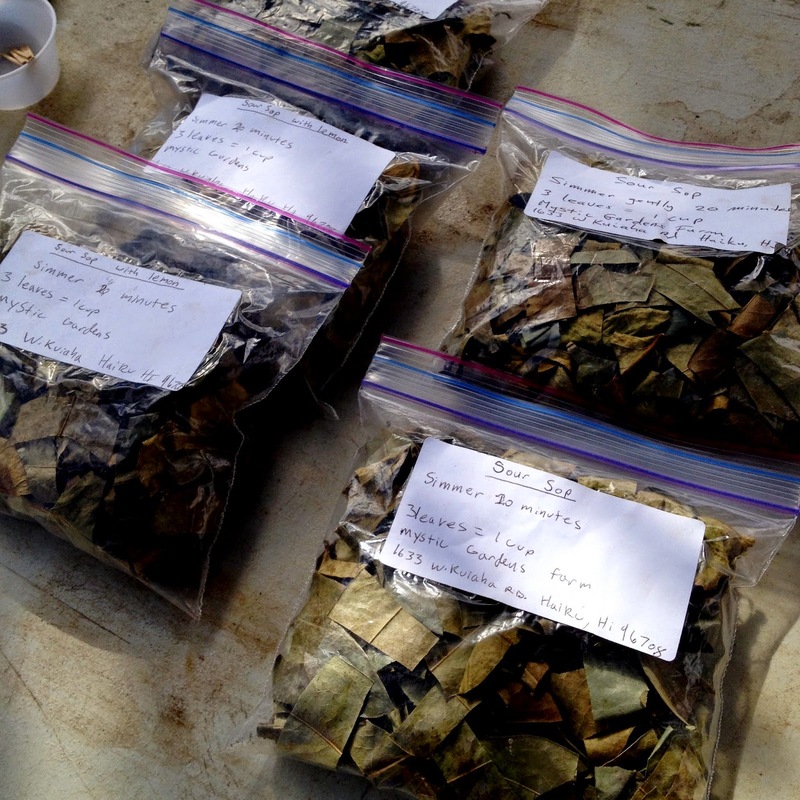 More moringa seed pods, cut up, ready to cook. April from Kupa’a Farms. Due to an internal conflict which I can’t really get into, the outcome is that Kupa’a Farms has been excluded from the market. Other, more logical and obvious attempts have been tried to resolve the conflict, but have backfired. Please take a moment to send some LOVE to the situation, send love to Gerry Ross, owner at Kupa’a Farms, send love to the manager of the Upcountry Farmers Market, and visualize Kupa’a Farms being allowed back into the market. Thank you. 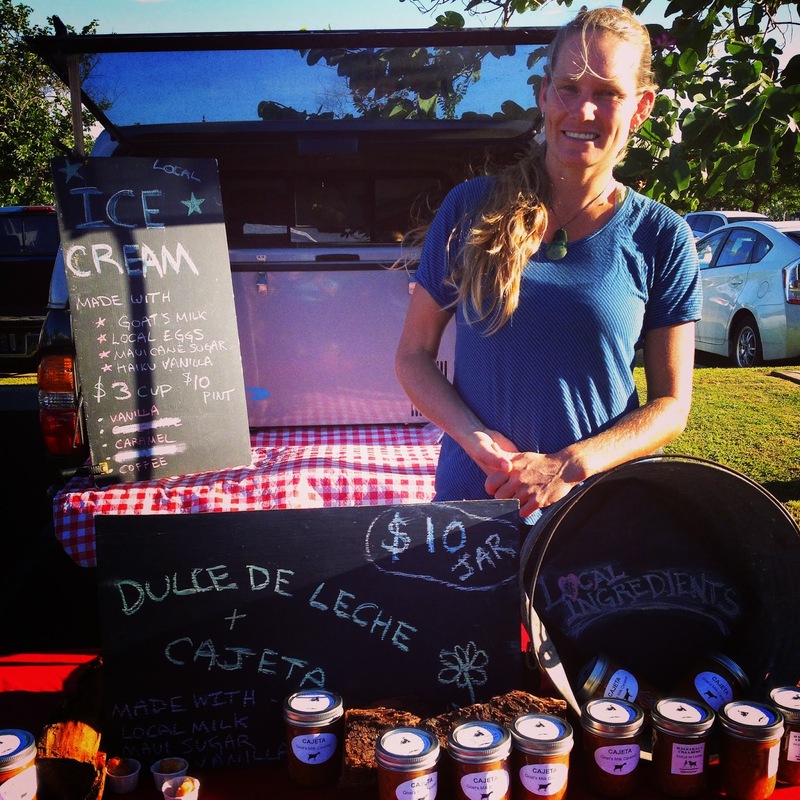 Rebecca of Haleakala Creamery with goat milk ice cream, dulce de leche (goat milk caramel syrup) and cajeta (caramel). 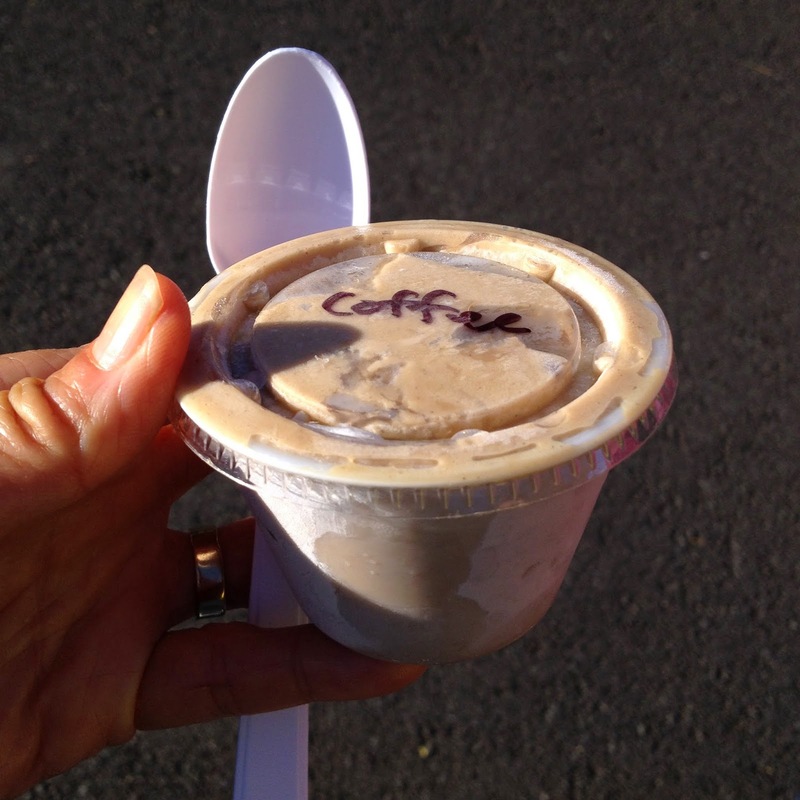 My $3 cup of goat milk coffee ice cream from Rebecca. Small but yummy. 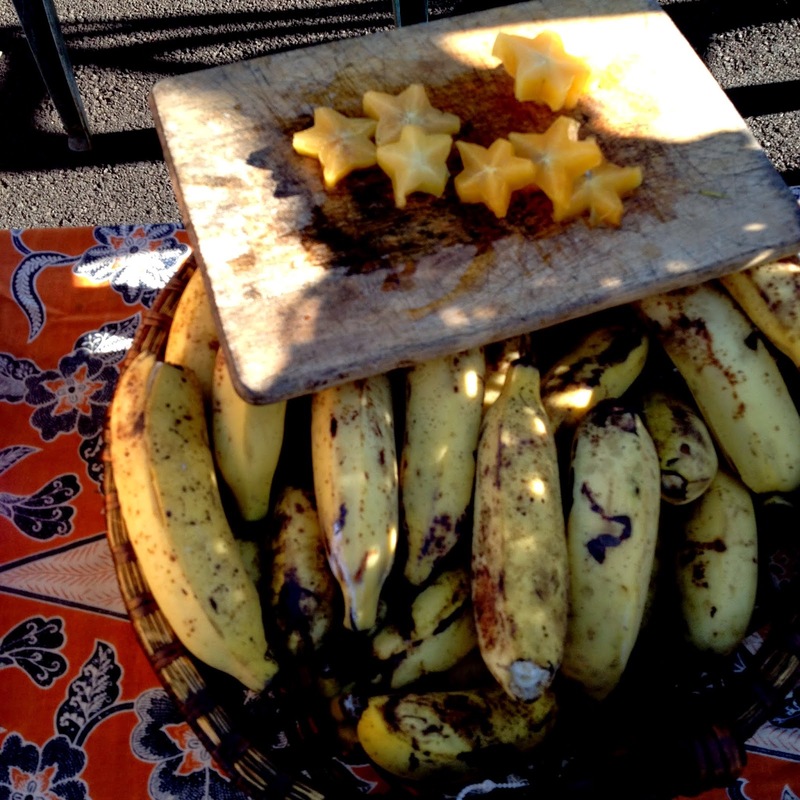 Star fruit and apple bananas. Hydraulic juice press. This is some serious juicing. The pulp is so dry and thin, it looks like a slice of green bread. 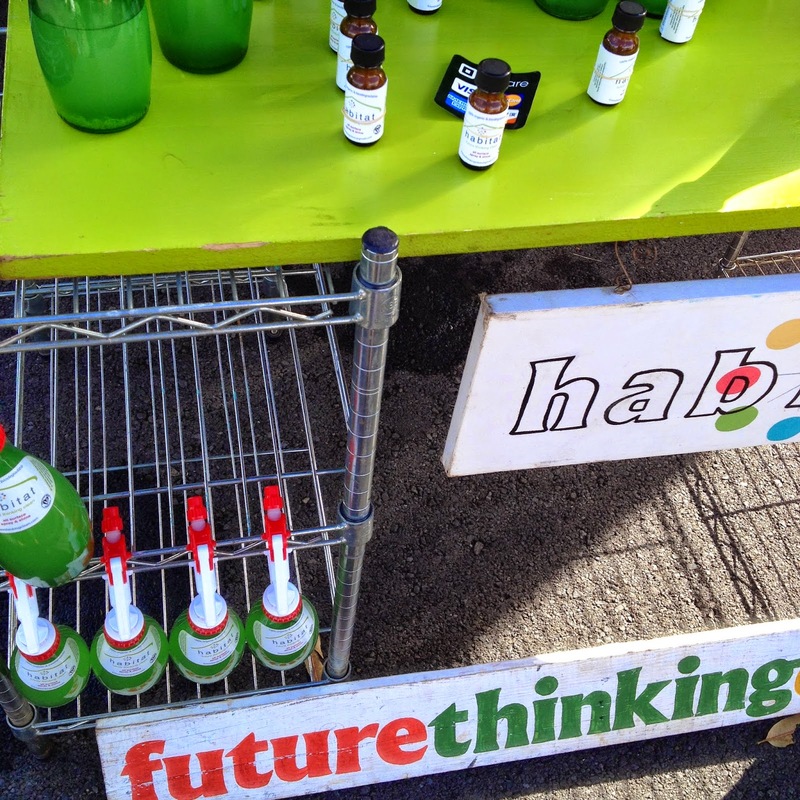 Future Thinking Habitat Non-toxic Household Cleaner. to make your own at home. 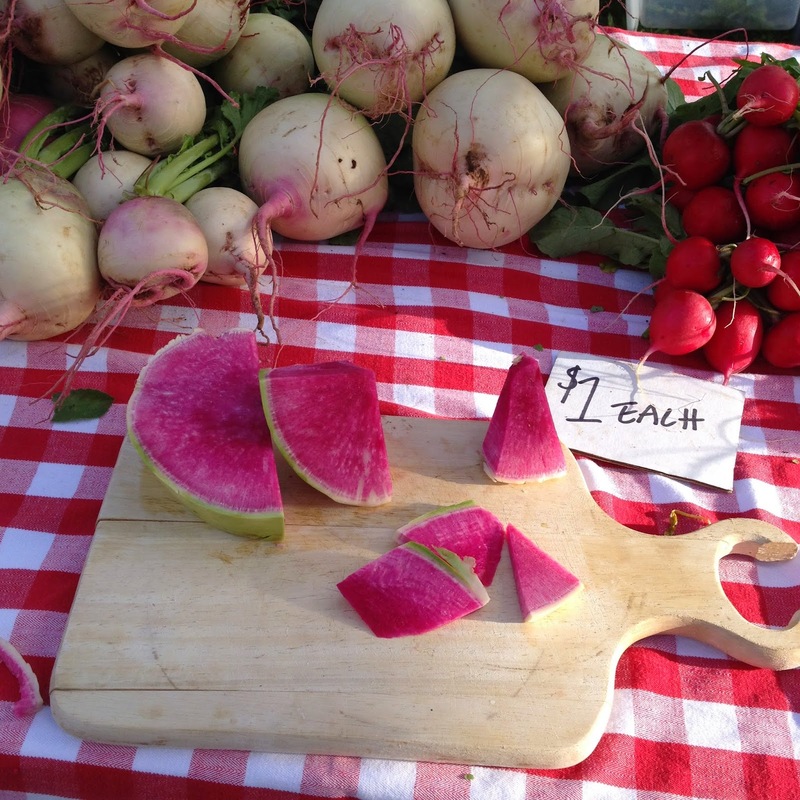 Watermelon radish. It's a huge radish that looks like a watermelon inside. By the way, there’s a big foodie event on 9/7/14 in Wailuku to raise money for hurricane relief on the Big island: Project Kokua for Hawaii Island. 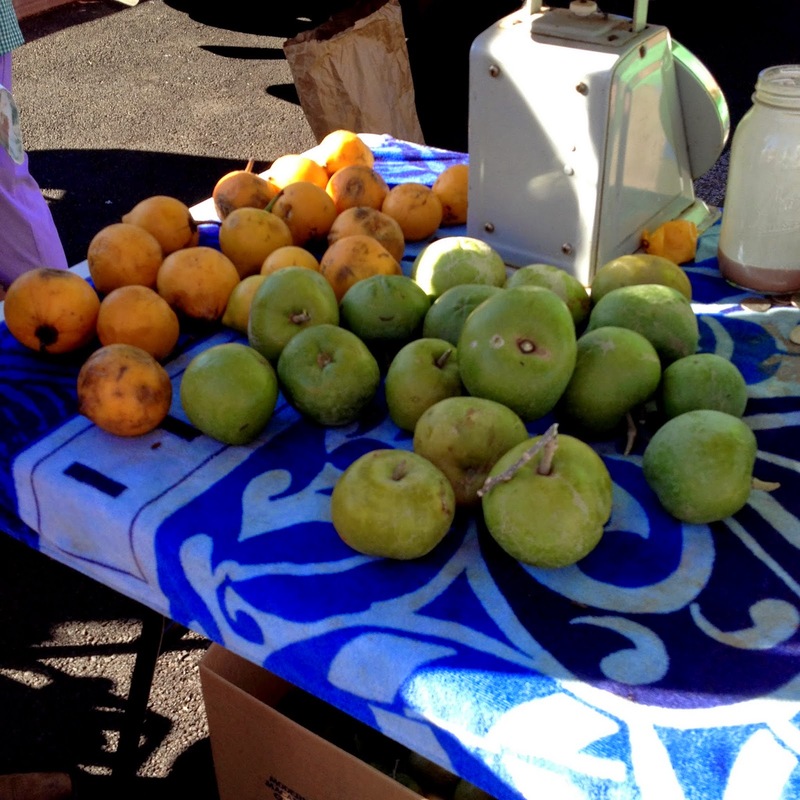 Maliko Gulch FarmersMarket – kind of defunct now, with issues about parking so close to a major highway, but they are still selling coconuts to drink and sometimes huli huli rotisserie chicken. 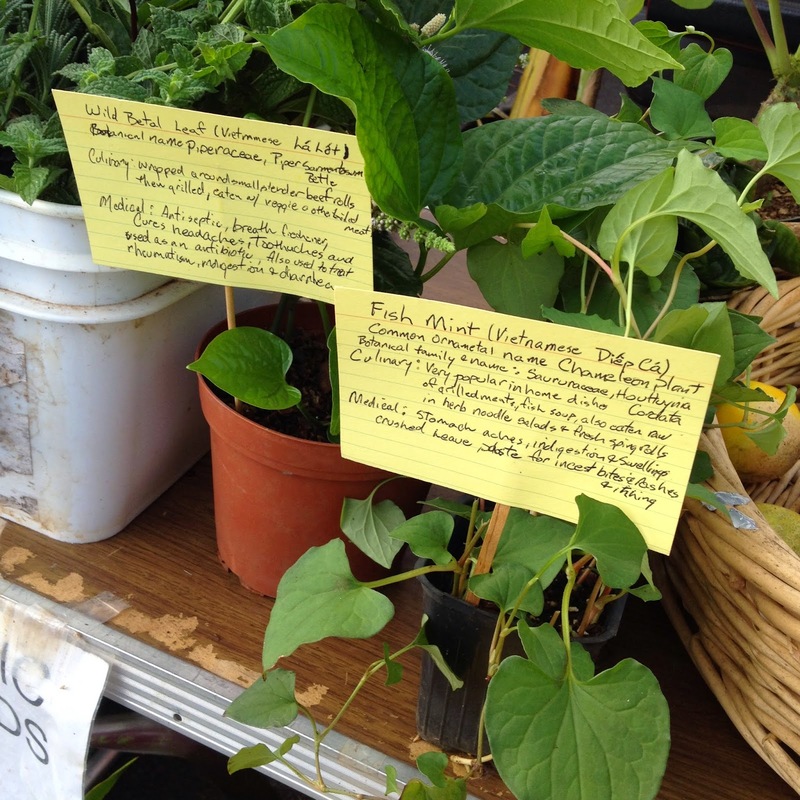 West Side Farmers Markets - I know there's a bunch but I don't live on that side of the island. Let me know. What a great market. We have them too and I will start going next week. Since I didn't get my garden in, I am looking for produce to can. Wonderful photos! Aloha Ann! Thanks for stopping by! You've really got my tummy rumbling between those yummy looking photos and great descriptions! 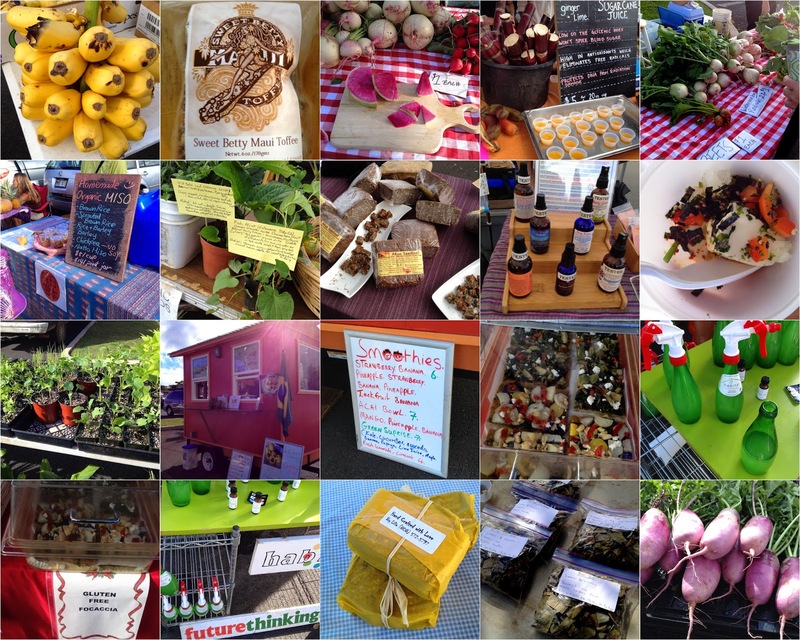 Farmer's markets are great, but this one looks spectacular! This is a call for submissions! real great post.Really thank you! Much obliged. Aloha Tui! You'd have to visit if you come over! I hear you! It's sometimes hard to see or reply to comments.